Once upon a time, Alexi Alfieri was a middle school teacher in a very small, very rural school. Actually, to be perfectly accurate, she was the middle school. She taught sixth, seventh, and eighth graders in one classroom all day for all subjects. Early in her teaching career, she began writing plays for her middle school class to perform. This led to writing holiday show scripts that incorporated every student in the school. And soon enough, she was writing fractured fairy tales, old-fashioned western melodramas, mystery dinner shows, and comedies of all kinds. 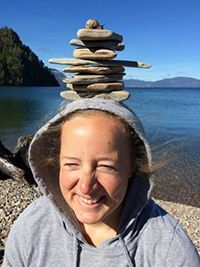 Alexi has an English degree from Oregon State University and a secondary teaching degree from Western Washington University. Now a professional playwright and director, she believes the most important thing a great production should start with is a great script. She enjoys writing plays that are funny, flexible, family-friendly, and, most of all, fun! Alexi has been an enthusiastic ice cream scooper, a nervous weather radio girl, a sassy secretary, an exhausted social services worker, a much-too-loud librarian, and a cheery camp cook. After fourteen years of being an educator, she became a professional playwright and youth drama director. She has been living happily ever after with her family in Florissant, CO.
To read more, see About Alexi Alfieri on her website.